You’ve heard the expression, “An apple a day keeps the doctor away!” It’s true! But for diabetics it may paint a slightly different scenario. Apples do contain carbohydrates which do have an impact on your blood sugar levels. BUT, these are not the same carbs and do not have the same effect on your blood sugar as the sugars that are in junk foods. So apples happen to be just about the most favorite fruit in the entire world. They are high in several antioxidants, fiber, and vitamin C. The nutritious parts of the apple are the skin and inner flesh which gets soft as it ripens. There happen to be over 7,000 varieties of apples and they come in the colors of yellow, green, and red. Why are apples so nutritious? They keep the doctor away for many reasons. Apples happen to contain nutrients, organic compounds, minerals, and vitamins C, B6, and vitamin K. The specific minerals in apples are manganese, copper, magnesium, and potassium. By having an apple each day you are getting over 10% of your daily fiber. From straight from the tree to the inside of your refrigerator, there are many ways to have your apples. You can have them in fruit salads, mince them, bake, mash, or even have them frozen. Another dish that comes to mind is apple pie. But before we dive into sweet desserts, let’s talk about how apples affect blood sugar and diabetes. You may lower your risk of getting diabetes by eating apples because of the antioxidants they contain. Research showed that people who had an apple a day lowered their risk of type 2 diabetes by almost 30% than those who didn’t eat them. There are numerous reasons why apples may help to prevent diabetes but the antioxidants play an important role. What do the antioxidants do? They can help prevent chemical reactions that are harmful in your body. So while they are responsible for many health benefits, the most important one is helping protect your body from chronic disease. So what are these antioxidants and what is their specific role? The first is chlorogenic acid which helps the body with using sugar more effectively. The second is quercetin which aids in slowing down your digestion of carbohydrates which helps to stop having spikes in your blood sugar. And the third is is phlorizin which can slow down your absorption of sugar and also lowering your sugar levels. 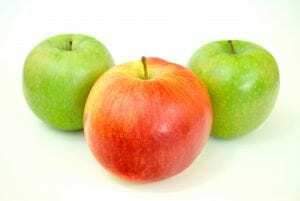 I feel that since apples are healthy for you in so many ways, why wouldn’t you eat them to get the most benefits in helping you with lowering your blood sugars and diabetes? So if you have apples on a consistent basis, it can help you to avoid type 2 diabetes and keep your blood sugar levels in check. Always make sure you check your blood sugar levels regularly. Having an apple gives you the feeling of being full without the calories. They are also a great source of fiber but also contain carbs. Knowing how many carbohydrates you’re having each day is important. Not all carbs are the same. Something that you should be aware of is that there are three things that can influence what your glucose numbers are at any given time. Protein, fat, and carbohydrates figure into what your sugar numbers are. Everyone is always talking about carbs and how bad they are for you. Your body needs carbs, but not too many and not all carbs are the same. For example, an medium sized apple has 25 grams of carbs but almost 5 of those are fiber. The reason this is important is because fiber helps in slowing down the absorption and digestion of these carbs and the result is that your blood sugar doesn’t spike nearly as fast as it normally would. In addition, fiber has also been shown to help protect against the onset of type 2 diabetes. Fiber helps to improve blood sugar control. Blood sugar levels are only somewhat affected by the carbs in apples. While the carbohydrates would normally raise blood sugar, the fiber in apples aids in balancing those blood sugar levels. While apples do have sugar in them, it’s the kind of sugar called fructose that has very little effect if any on glucose levels. Again, since the fiber is slowing down the absorption and digestion of sugar, the bottom line is that because sugar is entering your bloodstream much slower, it doesn’t raise your glucose levels too fast at all. Since diabetics are four times more likely to have a stroke or heart attack, it’s important to keep your sugar under control. There have been studies done revealing that a diet consisting of an apple a day had a decreased risk of stroke and vascular disease, common with folks with diabetes. Adding apples to your daily diet should be fine but you should monitor what you eat and see your doctor regularly. Your doctor should be aware of everything you do and eat. They know what’s best for you. Discuss it with them and have your labs done too. Apples are healthy for you whether you have diabetes or not. But it doesn’t mean to eat a dozen apples a day. Common sense might dictate one apple a day. And green apples have the least amount of sugar in apples. They are the best of the apples for reducing your risk of type 2 diabetes. There are other fruits that have less sugar are are even healthier too. Berries are the best. * Reduce cholesterol- Increased levels of LDL, the bad cholesterol are not good for your heart. The fiber that’s soluble contained in apples binds with the fats in your intestines and lowers your cholesterol levels, thus making it heart healthy for you. Let apples help to keep your arteries open. * Gallstones- Gallstones are no fun at all. I know from experience. When your body winds up with excess cholesterol in your bile for it to stay as a liquid and that isn’t good for it becomes a solid and forms stones. Want to help prevent this from happening? A high fiber diet and apples can help you out there. Avoid the junk food and being overweight. * Whiter teeth- This isn’t the be all and end all solution for white and healthier teeth but it does help. By eating and chewing an apple each day, it will help to stimulate more saliva in your mouth. This will result in having less tooth decay by decreasing the amount of bacteria present in your mouth. * Immune system- You want to keep your immune system healthy because it keeps you alive. the antioxidant mentioned before, quercetin can help boost and strengthen your immune system and particularly when you are under stress. Stay away from stress as much as possible. * Avoid hemorrhoids- We know these aren’t life threatening but very annoying and painful. Too much pressure in the rectal and pelvic area causes these and can be avoided with fiber in your diet. That’s why an apple a day! * Heart healthy- When you have a buildup of plaque in your arteries, it decreases the blood flow to your heart. The pectin in the skin of the apple helps to prevent cholesterol from getting into your system and having the chance to block the walls of your arteries. This can help to avoid coronary heart disease. Apples for heart healthy! * Weight issues- So obesity is a major health issue for many people and cause a variety of diseases such as high blood pressure, sleep apnea, type 2 diabetes, and heart disease. It’s recommended to have a diet that is rich in fiber as it fills you up without excess calories. Try eating a healthy diet that helps you keep the weight off once you lose it. * Cataracts- Your vision is so important and I feel that my vision is the most important thing to me and I never take it for granted. There has been research over a long period of time that involved people eating a diet rich in fruits which contain antioxidants, such as apples, and the results were folks having a 10%-15% less chance of developing cataracts. I don’t want cataracts so I’ll stick with my apple a day then! Your eyes can actually be stronger at nighttime because of a fairly high amount of vitamin A and vitamin C. Your risk of developing macular degeneration decreases because of vitamin A strengthening your cornea. Vitamin C has proven scientifically that it slows macular degeneration, lowers your risk of cataracts, and prevents loss of sharpness. 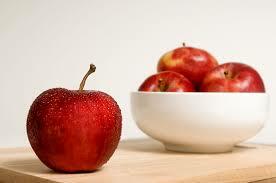 * Cancer risk- Apples are linked to lower risks of certain cancers because of their high nutrient content. Studies showed that apples can help to prevent colon cancer, breast cancer, and pancreatic cancer. * Decrease weakness- Patients who showed signs of weakness were given apples to help them recover faster from their particular illness and the apples helped in adding vitality, vigor, and taking away the weakness. * Your liver- Our bodies allow toxins into them constantly whether they come from drinks, or foods or what have you. Your liver is responsible for cleaning these toxins from your body. Fruits, especially apples, help to detoxify your liver. * IBS- The symptoms of irritable bowel syndrome are bloating, diarrhea, abdominal pain, and constipation. Healthcare professionals advise staying away from fatty foods and dairy products and to have a high fiber diet. Apples to the rescue! * Parkinson’s disease- You can help protect yourself against Parkinson’s disease by eating fruits and high fiber foods. This is due to the antioxidants’ ability to fight off the free radicals. While there are many health benefits of apples, the only thing that is toxic and poisonous are the seeds. They contain cyanide and during digestion regular consumption releases cyanide into your stomach. A full cup of apple seeds can lead to possible death so do NOT eat the seeds! What is the answer with apples and diabetes? The bottom line is that apples are very healthy for you, diabetes or not. You just have to exercise caution and not overdo it. Always check with your physician with any changes in your diet. While apples can help lower your sugar, if your numbers still aren’t where you need them to be and need additional help, this works best! If you have any questions or comments, please leave them below. I would appreciate it! Thank you for reading! Okay, but yea, apples are so healthy and should be in everyones menu, nice to find out how good effect it has to lowering type 2 diabetes risk, didn’t know that. Why I love apples it that they really boost my metabolism, I can feel it in minutes, am I the only one or have you experienced the same? Like, you eat an apple and you will feel that the work in your gut is on high-speed now. Also, apple cider vinegar which is one product of apples really helps to fight bloating and will keep your tummy slim, I am a living proof to that, you should try it too! I like your apple a day saying more than mine! 🙂 But either way it means the same thing. I do love apples for the same reasons you do. It does work on your body really fast and is very noticeable. Apples are a superfood and so is apple cider vinegar as you mentioned. I wrote all about that too right here: apple cider vinegar Thank you for your comments Melissa! I eat apples on a regular basis and I love them. It is great treat when I am stressed out. I just take off the tag and start munching on it. I do have a question though. Sometimes I get bored of eating apples as they are and would like something a little more complex. Do you know of any healthy recipes I can use apples in? Thank you in advance and I hope you have a great day! I eat apples everyday too because of how healthy they are for you. I like most fruits but apples are one of the healthiest so I make sure include them in my diet. They are beneficial in lowering blood sugar too if you have one a day. I hear ya on the apples becoming “boring” sometimes and that’s normal I suppose. If you’d like some healthy recipes using apples:http://www.eatingwell.com/recipes/19190/ingredients/fruit/apple/Thanks and have a great one!